Well, it smells very good and if the prices are correct "Bingo"
i have many pvc figures some of them look way better then polystone or resins. batman and superman considered grail pieces for alot of collectors. The very same Art of War made lot in PVC. Today's PVC quality is far over handpainted ones and it is a shame to Art of War when people repaint their statues and it looks better than original. I wish for limited series made from bronze to appear. I have a Daicon III figure from 80's, it still unpainted and look very "memorial". From my source these two pieces will be done with PVC, unlimited number. You can order 5000 pieces and as long as you pay they will do it for you. Also max factory is known for rereleasing the products made years ago. So if u like it go get them. Each probably gonna cost You anywhere from 200 to 300 bucks. If you want a fairly unique / rare limited piece u gotta go elsewhere. Also u can choose to get it two years later with around the same price. They will be steadily available. to anywhere overseas if anyone has any good suggestions for a retailer? More fresh pics from NYCC 2014! The prototype looks like PVC with sights of casting process (the last picture). He is non-scale so final price may vary even for PVC, not to mention that there is no announcement yet. They can make it polystone so fans keep your fingers crossed. Yes, we had to wait until painted prototype arrives. Looking at their Guts we can say that paint job would be well-made but personally I'd like to see more dark tones. I'll post some of his shots in his topic. I completely agree. A++++!!!!! Can't wait! That looks incredible!! I'm a sucker for deep purple and vibrant reds, this is to die for!! Hope to see photos with better lighting in the near future. Thanks for the update! Looks like it will be a 2016 release for now. Only 300 units produced worldwide. Will have to start saving from now. I am not a big fan of the face. I updated my reply with a better picture of him, the paint application really looks amazing though. 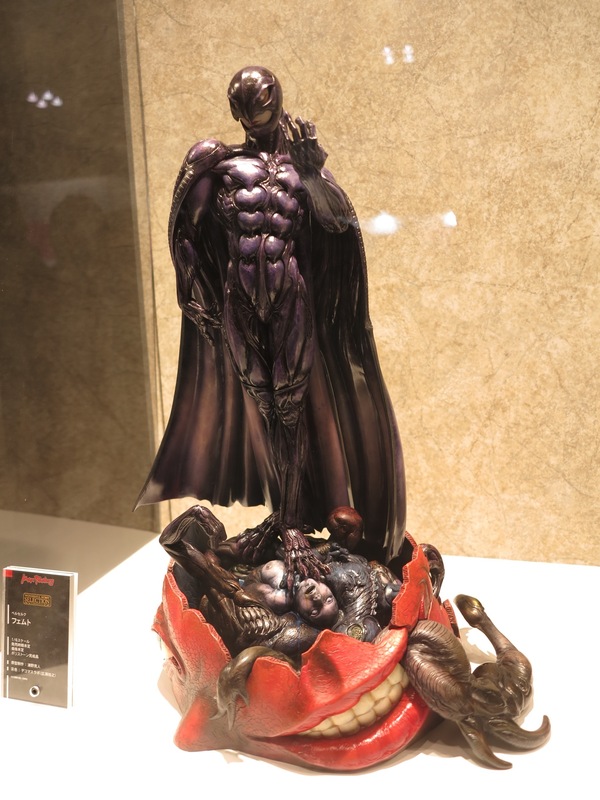 He is the most impressive Femto statue this far, I hoping for affordable price tag - in general GSC polystone statues costs around 80k JPY. Anyway, this is a must have. So glorious. Wow this statue...it's so close to perfection...yet so far. I dislike the face, it seems a bit off. That being said, the stylized wrists, calves, and crotch area are amazing. Seems kinda weird to comment on, but as far I know, the crotch area of Femto is usually obscured or omitted. It's really only in Volume 3 that we get a good view. Whoever designed that portion on this statue did a great job given the limited source material. It also matches the other stylized portions and actually works for Femto. Neat! Just that face....hrmmm. It's not the 'helmet' portion. Its definitely the inner face that's a bit off. Pose is kinda weird, but kinda works. As for the base, it's kinda crazy, but still works. The colors are perfect. Good god, I wish I had some disposable income... I absolutely love this statue. Just that face....hrmmm. It's not the 'helmet' portion. Its definitely the inner face that's a bit off. I agree. I gave it a A++++ before the 2nd picture was added. I have to say the inner face (the eyes) are a tad awkward. I need to see more pics to really say for sure! Either way, I'm still very excited for this piece. I need to see more pics to really say for sure! Here you go. A better picture of his face. Hahah, thanks! Well in this picture the face looks good!! !